2017 Hotter'N Hell Short Sleeved Jersey - Primal ---NOW 20% OFF! 2017 Hotter'N Hell Short Sleeved Jersey - Primal ---NOW 20% OFF! Storefront > 2017 Short Sleeved Jerseys. ---NOW 20% OFF! it Guide applies to jerseys, bibs and shorts. All measurements, apart from weight, are listed in inches. Primal apparel is engineered for the highest possible performance. To take full advantage of the technical properties of your Primal apparel it should fit close to the body so that moisture is effectively transported away from the skin to help keep you cool and dry. For a looser fitting jersey, please order one size up from the size shown on the chart. Women’s Size Chart SIZE X Small WAIST 24-25 CHEST 32-33 WEIGHT 90-110 HEIGHT Up to 62 HIPS 34-35 Small 25-27 33-35 105-120 61-65 35-37 Medium 27-29 35-37 120-145 64-68 37-39 Large 29-32 37-40 140-165 67-71 39-42 X Large 32-35 40-43 160-185 70-73 42-45 2X Large 35-37 43-45 185-205 70+ 45-47 3X Large 37+ 45+ 190+ 70+ 47+ Primal apparel is engineered for the highest possible performance. To take full advantage of the technical properties of your Primal apparel it should fit close to the body so that moisture is effectively transported away from the skin to help keep you cool and dry. For a looser fitting jersey, please order one size up from the size shone on the chart. To avoid the dreaded “closet shrinking clothes” never stop riding! 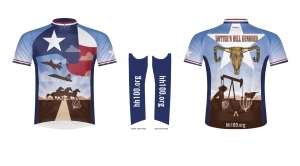 Write a Review of 2017 Hotter'N Hell Short Sleeved Jersey - Primal ---NOW 20% OFF!